Hien Quoc Ngo, Erik G. Larsson, and Thomas L. Marzetta, “Aspects of favorable propagation in Massive MIMO”, European Signal Processing Conference (EUSIPCO), Lisbon, Portugal, Sept. 2014. Great contribution! Thanks for sharing this. 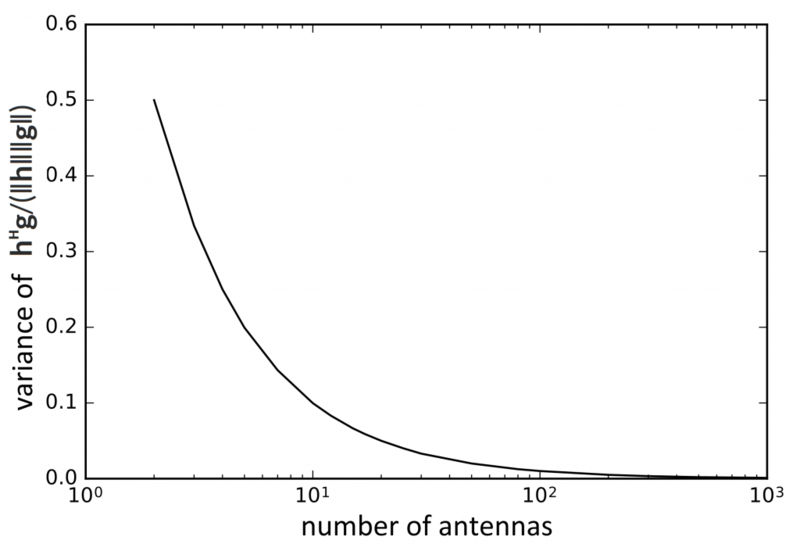 I think it’s worth to mention, in the definition, also the “channel hardening” property as a key benefit introduced by Massive MIMO: when the number of antennas is large (M) the channel becomes (nearly) deterministic, and hence, the effect of small-scale fading is averaged out. Hence, massive MIMO offers higher degree of channel hardening compared to multi-user MIMO. Thanks to the channel hardening (and channel reciprocity as you said), users can reliably decode the downlink data using only long-term statistical CSI (i.e., downlink training is not needed). How many antennas does a base station need to harden the channel? For the i.i.d. Rayleigh fading channel >50 (as well as for offering favorable propagation). Ngo, Hien Quoc, and Erik G. Larsson. “No downlink pilots are needed in TDD massive MIMO.” arXiv preprint arXiv:1606.02348 (2016). I agree with you. The channel hardening property does not depend exclusively on the number of antennas, but also on the channel model. Thank you for pointing that out. I think it is still a further fundamental distinction between Massive MIMO and conventional multi-user MIMO which is worth to mention. Recently, there are lots of works on massive MIMO relay system, but some scholars think that massive MIMO at relay node is not realistic, as relay is generally the auxiliary node for communication and could be of big size. What do you think of the massive MIMO relay topic. The sincerity anticipates your reply. A relay with a large number of antennas will be substantially larger than a single-antenna relay/repeater, but it also has a much greater potential of spatial multiplexing. One relevant scenario is when a macro base station acts as a relay. In this scenario, massive MIMO relaying is a contender with device-to-device (D2D) communication. If you have many single-antenna devices within the cell that wish to communicate pairwise in D2D mode, the interference level will be high and uncoordinated. Alternatively, all D2D transmitters could transmit to the massive MIMO base station, which then relays the information to the D2D receivers. This is a topic that we might return to on this blog! Thank you for sharing this. Just one basic question: Why in all definitions of Masive MIMO it refers to TDD mode? Does Massive MIMO operate in TDD mode only? What about FDD? Multiuser MIMO works at its best in TDD mode, since one can estimate the channels efficiently and accurately using only pilot signals (no codebooks and no feedback are required). This is exploited in Massive MIMO to deliver the MIMO gains under realistic conditions. You can also read our new post “Field Tests of FDD Massive MIMO”. Thank you for the sharing! After understanding what is massive MIMO, can anyone give a brief explanation on how Massive MIMO detection is performed and related recent papers including algorithms. For more detailed information, I would recommend the book “Fundamentals of Massive MIMO”. You can also watch the video of my talk “Advanced Signal Processing for Massive MIMO”, which cover the state-of-the-art algorithms. Could you please give me the answer to the question: Why do we need M ≫ K? I think based on the law of large numbers, the channel vector between different users become orthogonal to each other: hᴴg/M -> 0; it is favorable propagation, I do not see any thing related to the number K? Although hᴴg/M -> 0, as M->infinity, for any practical number of antennas, the interference between the users will be non-zero. Suppose the interference between two users is proportional to 1/M. If you have K users, the total interference will be proportional to (K-1)/M. To make the total interference small, we need M ≫ K. Otherwise, each user will exhibit a lot of interference. That said, you are right that M ≫ K is not a strict requirement for operating Massive MIMO. In some situations you might get a higher cell throughput by serving very many users such that M ≫ K does not hold. In Myth 6 of the paper “Massive MIMO: Ten Myths and One Critical Question,” we show that the optimal ratio of M/K can be rather small. Thank you very much for your response, Dr. Emil Björnson. This means that we still have room for signal detection research in massive MIMO other than linear signal detection (MMSE, ZF,..) in case M and K are very large but M/K is fixed (and not too large)? I am very interested in signal detection for massive MIMO so if possible, could you please suggest some survey or good paper in the recent trend of signal detection in massive MIMO? Sure, there is room for non-linear detection algorithms in Massive MIMO, but you should be aware of that people have been working on both linear and non-linear detection for multi-user MIMO for decades. The linear schemes (MMSE, ZF, MRC,…) were developed long before Massive MIMO was conceived. What Massive MIMO contributed with was a new methodology for performance analysis, which included imperfect CSI, and the utilization of behaviors such as favorable propagation and channel hardening. This made multi-user MIMO more practical, but the basic detection schemes did not change much. I recommend you to read Page 746 in “An Overview of Massive MIMO: Benefits and Challenges” (https://doi.org/10.1109/JSTSP.2014.2317671). I think it contains some useful references on non-linear detection. S. Yang and L. Hanzo, “Fifty Years of MIMO Detection: The Road to Large-Scale MIMOs,” IEEE Communications Surveys & Tutorials, vol. 17, no. 4, pp. 1941-1988, 4th Quarter, 2015.